We all want to live long, healthy and happy lives--but how do we do it? Over the years, much research has been conducted surrounding healthy longevity. Gender, emotional health and age certainly play their part, but until recently science may have been overlooking something even more important: having a firm sense of purpose in life. Researchers at Rush University Medical Center now believe that living with a purpose enhances positive well-being and overall health. How powerful are the effects of living a meaningful life? The Rush Alzheimer’s Disease Center in a study of 1,000 participants found that those living with a high sense of purpose were 2.4 times more likely to live free of the disease. Even the type of cognitive impairment that often preludes Alzheimer's was developed less often. Purpose is so influential that it was discovered to slow cognitive digression by an astounding 30%! Living with purpose is all about feeling that what you do matters, and that will vary from one person to the next. While one adult may find purpose in her career, another might aspire to create something to share with the world or ensure her family’s happiness. Anything that provides a direction in our daily lives, aside from simply taking care of ourselves, can positively impact our longevity. We thrive from the many benefits of living with a sense of direction and feeling like we are on a good and meaningful path. A separate team led by Dr. Patrick Hill of Carleton University noted purposeful living may have a stronger impact on longevity than any of the previously known factors. The risk of death in all age groups was reduced by 15%. Hill attests that living with purpose can have an even bigger impact on longevity than age and gender, which traditionally carried serious weight in such discussions. At Kendal of Oberlin, a sense of community makes a difference. As Dr. Hill’s research suggests, it’s never too late to develop purpose and reap its rewards. This resident driven community has ample opportunities to pursue passions and cultivate anew. Our community places a premium on creative outlets. KAO residents avidly create art in various mediums. We’re proud to host many events that allow residents to showcase their serious talent. One of our residents was recently recognized for his achievements in theatre. A mentor-protégé relationship is recommended by Hill’s group as a purposeful and rewarding activity. 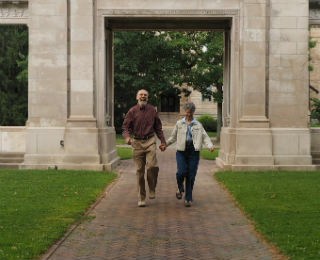 Intergenerational living is the norm at Kendal at Oberlin. Residents engage in meaningful connections with Oberlin College students, children from the Kendal Early Learning Center and the greater community. What better purpose than sharing a lifetime of wisdom and experience with a friend and getting some back in return? Kendal at Oberlin residents are good examples of living with purpose. Why not visit Kendal and meet some of them? Call 1.800.548.9469 to schedule your tour today.